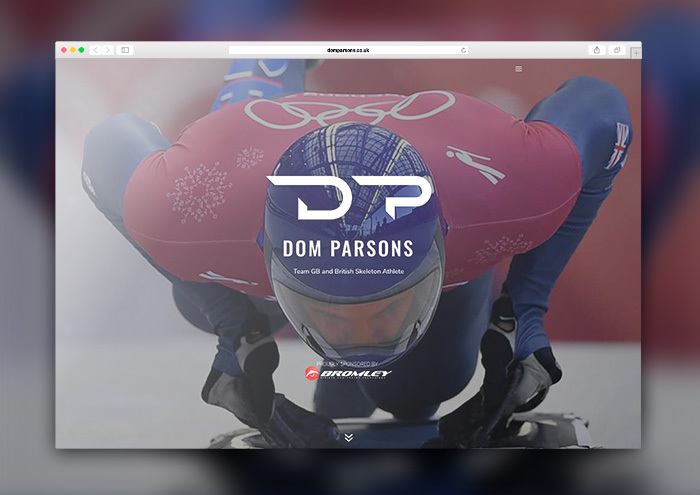 Local Kilkeel Company, NEOS Design Studio Ltd supported their global digital partners RANE Digital Marketing Agency as they worked on the Bronze Medalist, Dom Parson’s website after he was ready to update his career website on his return from PyeongChang Winter Olympics 2018. Dom Parson’s brought home the bronze medal in the men's skeleton event in January 2018. His medal was Great Britain's first at the Games, and the first for a British male in skeleton since John Crammond at the 1948 Winter Olympics. ‘I was delighted when Dom reached out to us to update his website and give it a facelift after his return from PyeongChang Winter Olympics. As well as working closely with local organisations and companies, it is great that our work is shining bright all across the UK. Dom was a great client to work with, his captivating videos and life experiences made the project a pleasure to complete. After I returned from the Olympics my website was ready for a bit of an overhaul. Neil did a great job refreshing the look of the website and the final result looks great! This very exciting project has come about for NEOS Design Studio Ltd through their global digital agency RANE Digital Marketing Agency after completing some very high profile websites such as the newly opened Beatles Museum in Liverpool, the award-winning website for Cascade Pools East Anglia Ltd and Composite Roof Supplies in London.